Hello Dancers, Vintage music lovers, and Bellydance enthusiasts! 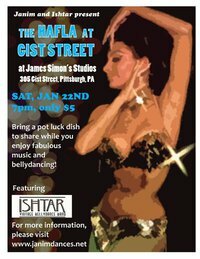 Ishtar and Janim are holding a community showcase event on January 22, 2011 at James Simon Studios on Gist St. The evenings dancers include Laila, Jemeena, Hakan, Nawal, Thalia, Mehira, Unsuk, Divinity, Sara, and Janim. We are also encouraging everyone to bring a middle eastern themed pot luck dish and BYOB. The evening promises to be full of amazing music, courtesy of our very own Ishtar, and spectacular performances by our local talent. As always, an open floor dance will close the night. New dancers are encouraged to perform or just hang out, we would love to meet you! Admission is $5 at the door! Looking forward to seeing you there!